This article, written by Civic Society member Richard Barry, appeared in the February 2011 edition of Stamford Living. We are grateful to the Editor for permission to reproduce it here. Richard Barry witnesses a symbolic reinstatement. William Stukeley’s was a life in two Acts. From the age of twenty five to forty he undertook what is now recognised as the first high quality archaeology in Britain. From age forty until his death at seventy eight, he abandoned archaeology and indulged in ever more fanciful speculation as to the origin and religion of the ancient Celts. By the end of his life he was a figure of ridicule, a reputation that has endured until recently. The cusp between the two Acts of Stukeley’s life occurred here in Stamford; it was here that his reputation ceased to grow and began its long decline. 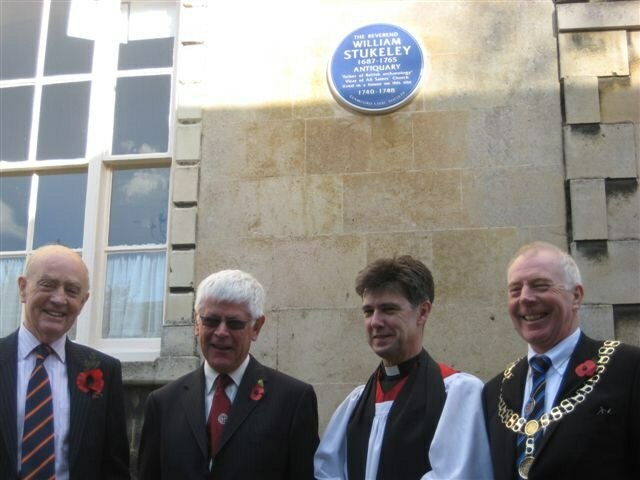 So it is fitting that Stamford’s Civic Society, in a symbolic act of reputational reinstatement, recently placed a Blue Plaque -- the ultimate accolade to the great and the good – on the site in Barn Hill where Stukeley had lived. This ceremony was performed on the 7th November, when the Blue Plaque was unveiled by Professor Dai Morgan Evans, former General Secretary of the Society of Antiquaries. The photograph shows, left to right, Civic Society Project Leader Peter Stevens, Prof Evans, Rev Mark Warrick and Mayor David Brailsford. William Stukeley was born in 1687 in Holbeach. His father was a lawyer with a small estate in Uffington but young William rejected a life of farming or law and studied medicine at Cambridge and St Thomas’s in London. After qualifying in 1710 he returned to Lincolnshire and practised medicine in Boston for seven years. It was during this time that he made friends with a number of influential locals, including Isaac Newton and William Wake, soon to be bishop of Lincoln and then Archbishop of Canterbury. And it was during his Boston days that Stukeley undertook his first two long distance rides across England in search of antiquities. Seven years of doctoring in the provinces was enough; it was probably boredom that led Stukeley to return to London in 1717. An income of £150 from the family estate plus his small medical earnings (probably less than £100) gave him enough money to lead an enjoyable bachelor life in London and also to continue with his long distance rides to explore England and lowland Scotland. The megaliths of Avebury and Stonehenge overwhelmed him with their grandeur and mystery – just as they do the tourist of today. But he was shocked at the way local landowners were destroying the huge megaliths to obtain building material, and he immediately grasped the importance of preparing for each monument a detailed record of every feature: “….to survey it, which may rescue some part from impending ruin [until] future times may hence be able to ascertain its purport, when this sort of learning will be more cultivated”. Stukeley’s surveys were brilliant work that today would be classed as “rescue archaeology” of the highest quality. In Grantham he gathered material for a biography (unpublished) of his friend Isaac Newton (including the first reference to the famous apple tree incident). He also got married, but his income – fine for a bachelor – was too small to support a wife and family. Stukeley (no fool in worldly matters) spotted that the benefice of All Saints in Stamford was vacant and rich (£589 per annum). With the help of his old friend William Wake, by now Archbishop of Canterbury, Stukeley enjoyed a fast-track ordination -- starting the process in June 1729, leading to ordination less than four months later. In October the Lord Chancellor granted Stukeley the All Saints living, apparently in the teeth of High Church opposition. Ah…the importance of having the right friends. With a wife, children and a flock to take care of, Stukeley’s days of long horseback journeys and painstaking field archaeology were clearly over. Instead he pursued his twin interests of gardening at No.9 Barn Hill and writing on religious antiquities but with increasing eccentricity. Two years after his first wife died, Stukeley married a friend’s sister. Evidently she was a rather difficult woman, but she brought to the marriage a settlement of £10,000. Freed from financial worries, he left Stamford and returned to the intellectual bright lights of London in 1747. Stukeley died in 1765. For all his eccentricity and argumentativeness he was by many accounts an immensely likeable man and it is delightful that the Civic Society has made this symbolic act of reputational reinstatement.